I wish I could say I’m a huge, huge Gaiman fan like my other friends are, but really, the only Gaiman book I’ve read in my life is Stardust. I read it twice and loved it, and I always associate good memories with that book. I meant to read more Gaiman, but the only other book I have at home is The Graveyard Book, which has been in two of our book club’s polls but kept on losing to other books so I had no reason to pick it up anytime soon. I knew he was one of those really awesome authors (plus he has the most awesome New Year’s messages), and I know I had to read more of his works but it just doesn’t really come up in the priority list. So when my friends started raving about The Ocean at the End of the Lane, I was only mildly curious. Until I saw the book, touched it and realized how pretty the physical copy was. Needless to say, after a few moments of touching the cover, I went ahead and bought the book. Yes, I am easily swayed like that. 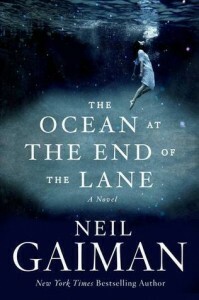 The Ocean at the End of the Lane is a short book, about an unnamed narrator who visits his childhood home and goes to the end of the road, where he remembers his childhood friend, Lettie Hempstock, and her mother and grandmother. It started with a man who lived with them who committed suicide, and then all sorts of weird things happened after that, trapping him in a bizarre world that has enchanted his family. It’s too much for a little boy to deal with on his own, except that he wasn’t really alone because his new friend Lettie promised to protect him at all costs. The Ocean at the End of the Lane held me captive from the first page. It had a lovely sort of storytelling that was comforting and creepy at the same time — you know it’s not real, but there’s that fear of the things that our hero is getting himself into. I liked how honest and quiet the narration is, how the hero as a boy tried to make sense of things and be brave, even if things are getting creepier and creepier. You can feel all the doubt and worry and fear in him, and I wanted so much for him to prevail, for him to find a way out of things and save his family. It felt a little bit like a fairy tale, with how everything was set up, but also not so much, because there were really some frightening instances. Not scary in the sense of ghosts, or how horror movies were scary, but more of I’m so scared for you type of terror. I think you’re doing better than you were the last time we saw you. You’re growing a new heart, for a start. Isn’t it amazing? I read this book straight through, then went right back to the beginning to read it again. (I NEVER do that any more.) It was very different from what I expected. Neil Gaiman is a master of storytelling. There were many quotable quotes in this book, and I highlighted them all on my Kindle copy, with the result that nearly every other page had shaded paragraphs or lines. Hehe. I still smile when I remember how much I enjoyed reading this! :) I’m curious about the audiobook, especially since Ronnie and Aaron loved that version.